One of the most common mistakes people make when they start walking for fitness is to buy walking shoes that are the same size as their dress shoes. Learn why you need a bigger shoe size when you are walking for more than 30 minutes at a time. Feet swell a full shoe size or more during walking or running. As you are exercising, your heart is pumping more rapidly and sending more blood to your extremities. The smaller blood vessels have more blood flow. You will notice that your hands warm up after a few minutes of walking on a cold day. The same is happening with your feet. As you continue walking, you may even notice that your hands are a bit swollen—and so are your feet. This is normal and you should expect it to happen. Blisters: Your feet will rub against the sides of your shoe as well as your toes rubbing against each other. This friction can lead to blisters. Black toenails/losing toenails: When your toes jam against the end of the toe box of the shoe, you can damage the toenail, leading to a bruise under the toenail that turns it black. Often, this leads to losing the toenail. While it will grow back, this can be painful and distressing. Bunion pain: If your foot doesn't have enough room in the shoe, it can press on a bunion and lead to pain. Hammertoe pain: If you have hammertoes, wearing a shoe that is too small can lead to more pain. Increased wear on your shoes: Your shoes may have bulges or worn spots where your toes are rubbing on them. Most women wear dress shoes and casual shoes that are too small. As a result, they may not know what correctly-fit shoes feel like. 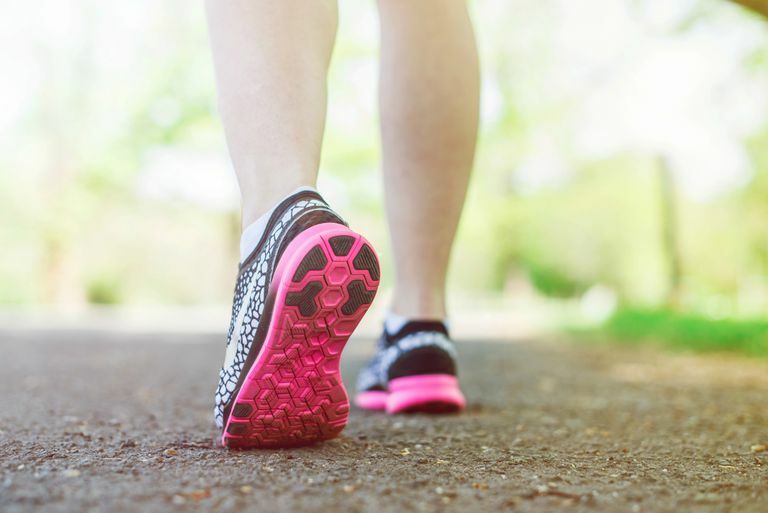 Your feet swell even more when walking or running, so you may need athletic shoes one to two sizes larger than the size you normally wear (which, again, is likely to be already too small.) The American Orthopaedic Foot & Ankle Society notes that almost 90 percent of women surveyed wore shoes too small or too narrow and 80 percent had foot problems. Many suffered from bunions, hammertoes, bunionettes, corns, and other foot problems caused by or worsened by too-small shoes. Your feet will also become wider as you mature, and change throughout the years. If you have gained or lost weight, so have your feet. What fit 10 years ago is unlikely to fit well now. You should get properly fit for shoes each year. You should be able to wiggle your toes in the shoes. There should be a finger's width of room in the toebox when you stand up before you have been walking. Your heel should be contained in the heel cup, not letting your foot slide forward in the shoe with every step. It is best to get fitted for your walking shoes at the best running shoe store in your area, the one that serious runners go to for their shoes. Those stores are the most likely to have a sales staff interested in getting you fit into the right shoes. Unless you have gotten properly fit for athletic shoes, you may be one of the 90 percent who don't know what properly fit shoes feel like. It's smart to go for a shoe fitting after a walking workout or at the end of the day when your feet will be more swollen naturally. Wearing shoes that are too big can produce some of the same problems as shoes that are too small. If your foot slides forward in the shoe with each step, you can get black toenails or lose toenails. You may also get blisters or irritate your bunions or hammertoes from the extra friction and impact. It can wound your ego to buy shoes in a larger size, but it will make your feet much happier. Happy feet, happy walking, happy life. Make the trip to the running shoe store to find out what size will suit you best. Athletic Shoes. American Academy of Orthopaedic Surgeons. Position Statement: Cosmetic Foot and Ankle Surgery. American Orthopaedic Foot & Ankle Society. May 5, 2015.